Gives 24 hours of antiperspirant protection. Helps to reduce underarm skin irritation after shaving. Delicate subtle scent helps to keep you feeling clean. Moisturises to give superior underarm care. Contains ¼ moisturising cream for beautifully soft and smooth underarms. Glides on easily. Dove Original Anti-Perspirant deodorant cream provides up to 24 hours protection against underarm wetness and contains our unique 1/4 moisturising cream formula. Let's face it, underarm care is one of those things that?s so easy to forget about, right? We want smooth underarm skin that can cope with regular shaving, and we want it to stay dry, no matter how hot or how busy we might be. Is it too much to ask? Not when you're using Dove Original Anti-Perspirant Deodorant Cream. This antiperspirant is like a little spa break for your underarm skin every morning. Its ¼ moisturising cream soothes and helps your delicate underarm skin to recover from irritation caused by shaving. In fact, it is proven to improve the look and feel of your underarm skin after just five days of use. Dove Original Anti-Perspirant Deodorant Cream is 100% alcohol-free, to help reduce the irritation and dryness that alcohol can sometimes cause and the delicate scent will help to keep you smelling fresh and clean all day long. You can just apply it in the morning and forget about it - only now you'll have that underarm care sorted too. 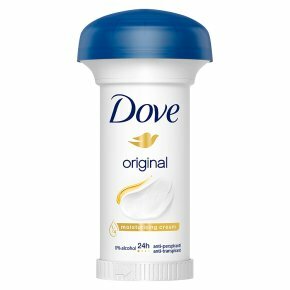 Dove Anti-Perspirant ? Cares for your underarm skin.